Florida is a state with a long coastline and an understandable passion for seafood. We enjoy a huge variety of fish as consumers, while commercial fishing provides a livelihood for many people. According to the National Oceanic and Atmospheric Administration (NOAA), Florida was one of the top 3 states in the U.S. for commercial fishing jobs in 2012. 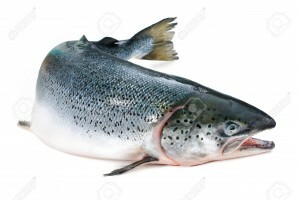 Atlantic salmon are both farmed and wild-caught. So it makes sense to understand and protect the bounty in our seas. But according to the Monterey Bay Aquarium – which houses the nonprofit research organization Seafood Watch – “Ninety percent of the world’s fisheries are now fully exploited, over-exploited or have collapsed.” This means that we are removing fish at a rate that exceeds their capacity to replenish themselves in the wild. That’s a daunting thought in a world of 7 billion people. One answer to overfishing is fish farms or aquaculture. Indeed, according to Seafood Watch, over 50% of fish consumed today is farmed and that number is expected to rise. But even fish farms have their challenges. What’s a fish lover to do? Here are some pros and cons for both wild-caught and farmed fish, with regards to how they affect the environment. Fish provides high quality protein in a hungry world. Fishermen in coastal areas around the world help feed their families and communities. Fish farms today could not supply the fish needed to replace wild-caught fish globally. There are a lot of fish in the sea. Some fish populations that have been depleted – like black sea bass – have also been successfully restored in the wild. We know that fishery management can work. Overfishing. In the absence of coordinated management, fish species can be overfished to the point of extinction. For example, in the 1992 the cod fishery off the Grand Banks collapsed. Two decades later, it has still not recovered. Damage to the ocean floor with fishing gear like trawls or dredges. Equipment that scrapes over large areas of ocean floor do catch fish, but also destroy corals, sponges, and habitats that serve as food, shelter and breeding grounds for other sea creatures. Bycatch. This is the term for catching unintended species along with the fish that lands on your plate. Bycatch ranges from turtles to dolphins that may be injured or die even if thrown back, and they number in the millions each year. High carbon footprint. Fishing boats burn fossil fuels, as do the trucks that carry fish to market. A local fish farm may supply fresh fish while transporting it far fewer miles. Virtually any fish can be farmed. In the U.S. the top 3 varieties are shrimp, Atlantic salmon and tilapia. Potentially smaller carbon footprint. You don’t have to travel to where the fish are, and then bring them back over long distances. Fish farms can be located anywhere, including on dry land. Disease. Crowded conditions in fish pens can lead to disease among farmed fish, and even be contagious to wild fish if the pens are located in open water. Escapes. According to Seafood Watch, “Most farmed species are distinctly different than their wild cousins.” Upon escaping, they may become an invasive species that pushes out native wild fish species. The spread of the Asian carp – a species that wasn’t even raised for food but escaped when a fish farm flooded – is a case in point. Pollution. Concentrated fish waste in one area can affect not only the farmed fish, but wild fish if the farming method is not a closed system or careful to capture and treat the waste. At this time, there is no simple answer to the wild vs. farmed fish question. It depends on many variables ranging from the particular type of fish you want to the type of fishing gear used. Further, the answer will change over time as some fish stocks replenish, fishing equipment is re-designed to catch fish with less damage, and our data about fish populations get better. Look for the Marine Stewardship Council (MSC) seal on fish you buy. The MSC is an international nonprofit that certifies that fish has been sustainably managed all along the supply chain – a real challenge. Ask your grocer or restaurant server, “Where does this fish come from?” It’s not intended as a ”gotcha” question and indeed they may not know. But the more they hear this question, the more likely they will pay attention to the issue of sustainable seafood and take action. Use the Seafood Watch app. No matter where you are, it can recommend seafood that is a “better choice” and identify local restaurants that serve sustainable seafood. This is one fish story that will continue to unfold!